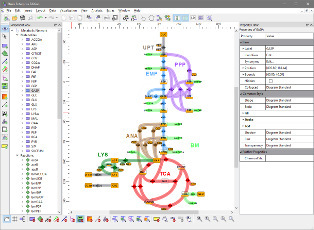 Omix feels like a typical all-purpose graphics software and provides a plenty of valuable features you especially need in combination with biochemical networks. With Omix, stylish network diagrams can be created for presentation and publication. One of the most important application fields of Omix is the visualization of omics data. Indeed, the program name Omix is derived from this bio science neologism, because Omix can visualize the whole range of omics data from life science research. Data is visualized in the network context. This allows a direct inspection of data in the mind map of the biological system for rapidly capturing the essence. The unique approach of Omix: the manner data is visualized in the diagram can completely be designed by the user because the diagrams and their graphical components can be programmed in the Omix Visualization Language™ (OVL). This brings highest customizability. The user can adapt visualization to individual preferences and requirements. Documents created with Omix do not only contain the graphical network diagram that can be exported into wide-spread pixel and vectorial image formats. They contain the corresponding network stoichiometry that can be used for any other purpose, especially, modeling and simulation. Therefore, Omix can be extended with plug-ins that support popular network model formats. combines a visualization and modeling tool. Droste, P., Miebach, S., Niedenführ, S., Wiechert, W., and Nöh, K. 2011. Visualizing multi-omics data in metabolic networks with the software Omix − A case study. Omix was developed in cooperation with the institute IBG-1: Biotechnology, Forschungszentrum Jülich, Germany. Refer to the Modeling & Simulation Group and their scientific contribution in systems biology. Copyright © 2019 Omix Visualization GmbH & Co. KG. All rights reserved. Omix® is a registered trademark of Omix Visualization GmbH & Co. KG.